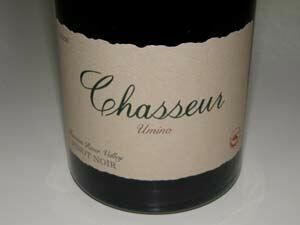 The "Umino" vineyard Pinot Noir from Chasseur is made from grapes harvested from Dave Umino's vineyard block located on rolling hills southwest of the township of Sebastopol on Blucher Valley road. 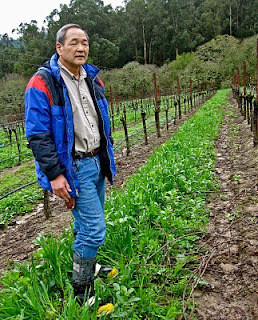 Against the advice of local farmers and consultants Dave planted the property to 4 Dijon clones (115,667,777 and 459) of Pinot Noir in 1997. This wine is aged for 10 months in French oak barrels. On the palate this wine is exactly what I have come to expect from the wines made by Bill Hunter, that is wines that are pure, fruit driven, intense, delineated, and just plain delicious. I get savory and delicious flavors of fresh red raspberries, tangy bing cherry pie filling, crushed rock, wild strawberries eaten with some of their leaves still on, cranberry sauce, and blood orange.